access - allowing you to see things when you have been identified The IAM Project facilitates group curation: if you're in a group, you can see the things that group has access to. 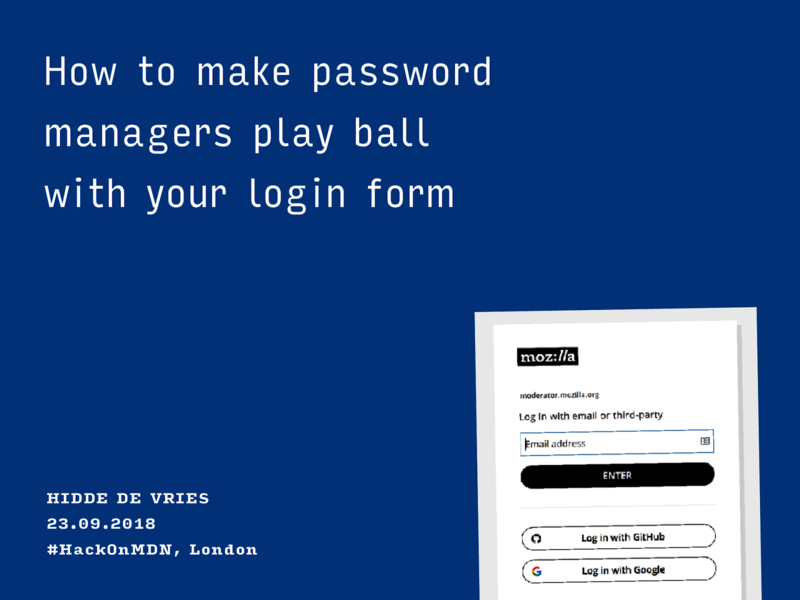 Autocomplete autocomplete="off" often ignored autocomplete="username" autocomplete="password"
The autocomplete attribute offers a declarative mechanism by which websites can work with user agents to improve the latter’s ability to detect and fill sign-in forms by marking specific fields as "username" or "password"
View How to make password managers play ball with your login form. This year I spent more time then I’m willing to admit on password manager compatibility for the Mozilla IAM login. I’d like to share some lessons learned.